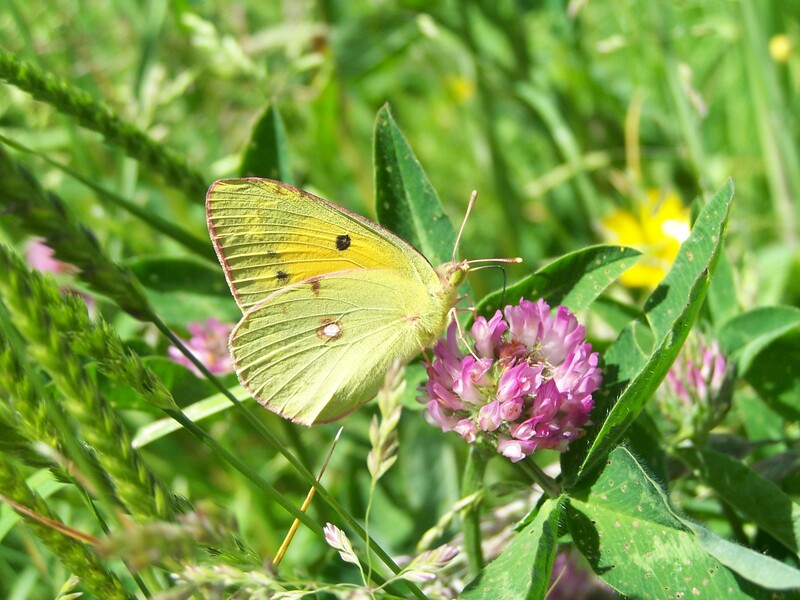 There are plenty of butterflies out there this month, but to see them forget the garden Buddleia and go out into good wild grassland where you will see the July butterflies that keep mainly to the wilder places. Gardeners often feel shock at the often-empty July Buddleia, fearful of a butterfly population crash, but it’s just a question of searching in the right places. 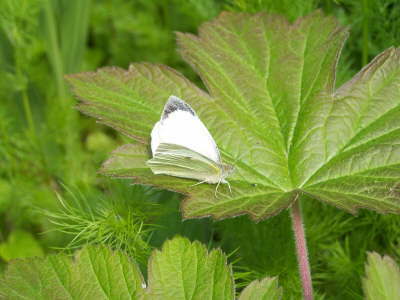 A stroll along a sunny ride through native broad-leaf woodland will produce a good collection of species, notably Silver-washed Fritillary, our largest native butterfly, and on the increase. If you need some positivity about our natural world, the Silver-washed Fritillary population’s upward trajectory is one way of getting it. It is, however, absent from Scotland, absent from most of England and extinct in The Netherlands. This lovely butterfly is thriving in Ireland’s woods, abundant where light reaches the woodland floor to heat the area around the larva’s food plant, Common Dog-violet. The adult loves to take nectar on bramble and it is certainly a beauty when fresh out of the pupa. Enjoy them now, as their finery soon dims (“When I consider everything that grows/Holds in perfection but a little moment” (Sonnet No. 15, William Shakespeare)) and the aged bedraggled butterflies a gutted ruin of once splendid architecture. Ringlets are everywhere tall wild grasses grow with some shelter/shade, especially in damp and humid places. 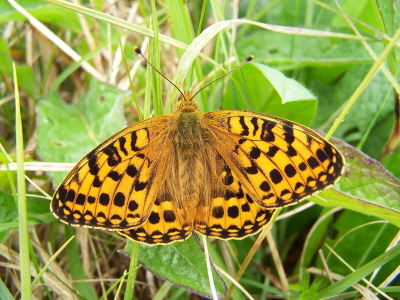 This humble ‘quiet’ butterfly, its dark, almost black upper sides fringed with white and its light brown undersides decorated with white-pupiled, black eye-spots ringed in gold bobs gently along the same woodland tracks and lanes, a very different personality to the resplendent orange Silver-washed Fritillary which flashes deep, shining orange while he dashes past. Meadow Browns like this habitat but generally prefer open grassland with flowers. 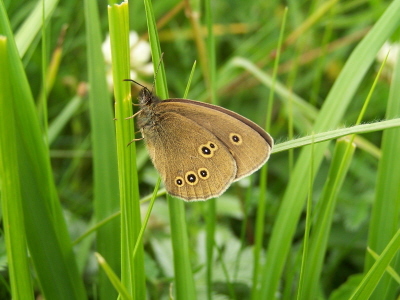 Large but low-key, this also has a bobbing flight, but generally appears more purposeful in its manner than the easy-going Ringlet. 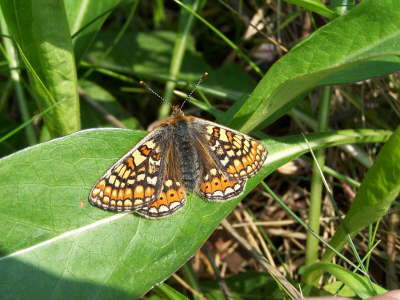 Wild, open flower-rich grassland by the sea or on mountain/hill slopes, cliffs, limestone grassland and cutaway bog is where the Dark Green Fritillary makes its home. To watch its energy and power, you would doubt that its home is large enough for it, but in fact this dramatic flyer usually stays local. Finally, early Brimstones are appearing. These are skittish and wary, as if confused by the heat of high summer. This lovely butterfly, daffodil yellow in the male, greenish-white in his mate is our longest-lived adult butterfly so butterflies that have emerged this early need to make an extra effort to preserve themselves until after they breed, mainly April-June 2018. Click on the photographs for the enlarged view. Silver-washed Fritillary, showing the silver streaks on its mossy hindwing, a useful colouring for a tree canopy rooster.©J.Harding. Meadow Brown, probably our most numerous butterfly©J.Harding. A warm, billowy day yesterday (24 June 2017) offered great conditions to see what was on show in the Lullybeg area in Kildare. Orchids on display include Twayblade, Common Spotted Orchid, Bee Orchid, Lesser Butterfly Orchid and Marsh Helleborine, featured below, a lover of lime-rich soil. The heady fragrance of Fragrant Orchid will be released in July. Misumena vatia has taken up its station on the orchids, much to the disadvantage of this aged Peacock…. Peacock meets its nemesis, misumena vatia. 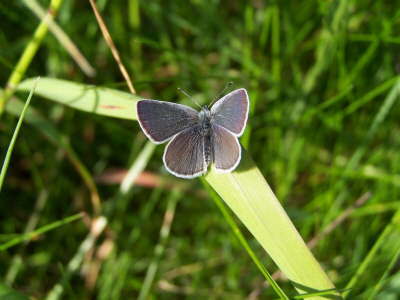 In June 2014 Butterfly Conservation Ireland, having assessed the habitat at a coastal site in County Meath as suitable for the endangered Small Blue released a small number of adults. The first release occurred on 7 June with a second release one week later. No further release was made. Since 2007 the donor site, Portrane, has sustained massive habitat loss due to erosion of the east facing sand dunes at Portrane. Since 2007, over 90% of the Small Blue habitat on the affected dunes have been removed by the sea. Meanwhile, the dunes along County Meath coast lacked the Small Blue, despite the presence of the sole larval foodplant, Kidney Vetch, growing in highly suitable situations over an extensive area. On their release on 7 June females began to lay immediately, indicating the site’s suitability. However, searches of the release site in 2015 and 2016 which took place in overcast conditions failed to find any trace of the butterfly. The sunny weather on 20 June, when the temperature peaked at 20 Celsius, made for excellent search conditions. 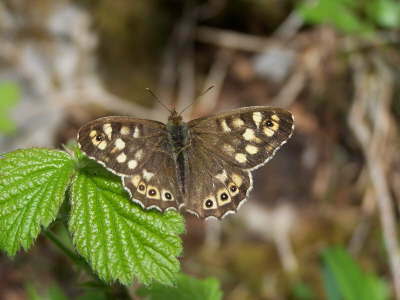 The release site was searched and seven butterflies were seen, including an egg-laying female. 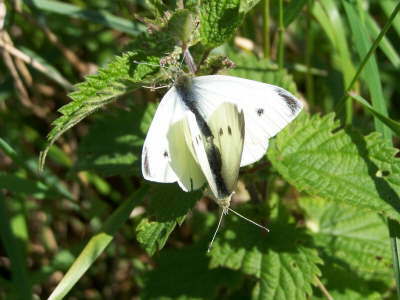 She was photographed ovipositing (see below) on a west facing plant adjoining a sand track; the release site was chosen because it contains the food plant growing among grassland vegetation with areas of bare sand, (the butterfly does not appear to favour areas with a very high density of the food plant, probably because the micro-climate is not warm enough) the site is sheltered and has a west facing slope. A further visit on 21 June revealed three egg-laying females. 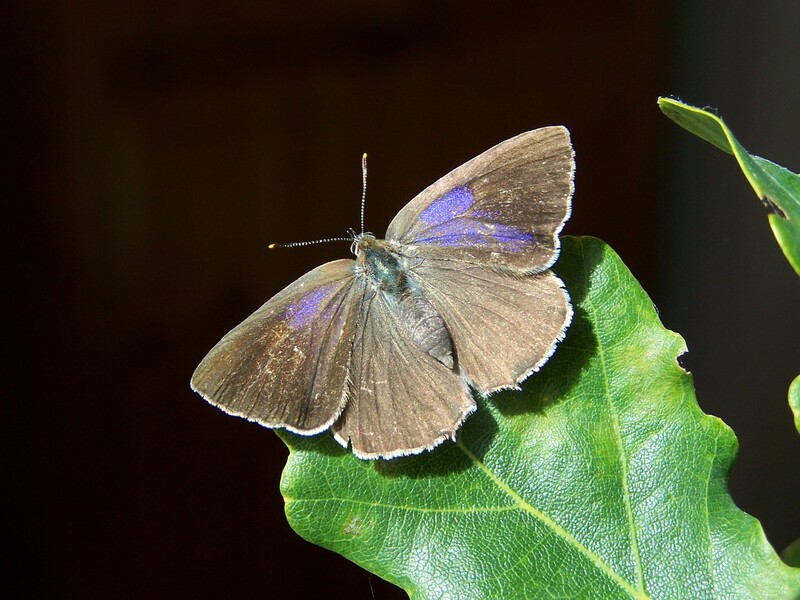 The butterfly has not expanded far beyond the release site; its area of occupation has expanded only a few metres north and south of the release point. This indicates a high degree of loyalty to the natal area. 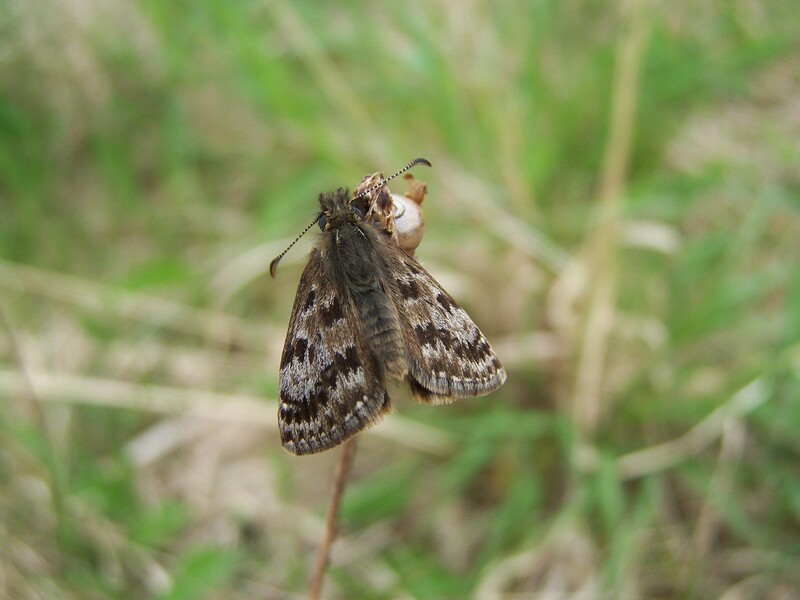 The smallness of the area occupied (it was searched for in the area around the site and not found) also suggests that the butterfly is not mobile and/or may have a low rate of reproductive success. 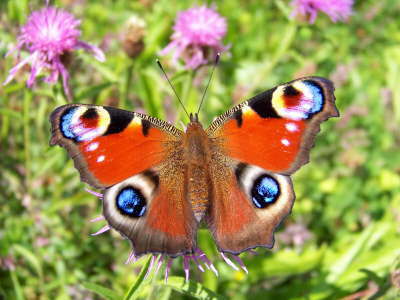 The butterfly lays only one egg on each flower head and may only lay on one flower head per plant. 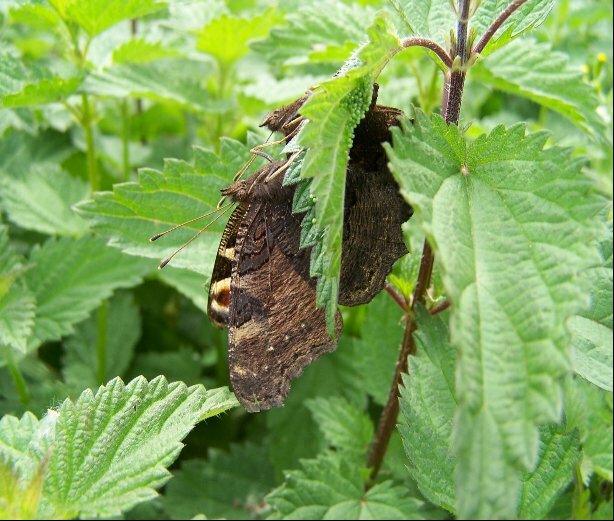 On 21 June two females were observed rejecting a number of food plants, presumably because these already held an egg. 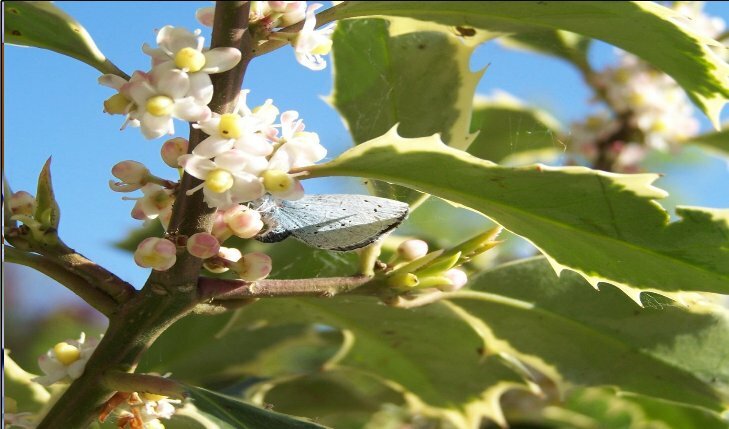 This results in females moving from the original release zone in search of suitable food plants, and in turn to an increase in the the butterfly’s distribution as the population grows. In time it may expand to occupy all the available habitat along this stretch of coastline. Along the Dublin coast the Small Blue has not shown significant mobility; it has not, for example, expanded its Dublin distribution to include Bull Island, a site that has existed for around 150 years. This may be due to the absence of suitable habitat between Bull Island and the closest population north of this, at Howth. 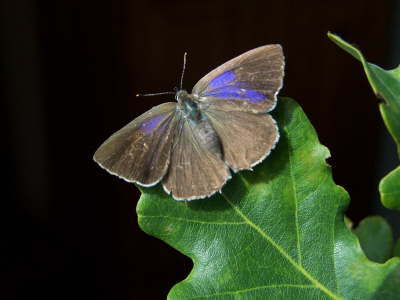 The Small Blue may be sedentary throughout Ireland, emphasizing how important it is to protect the breeding habitat of one of our most endangered species. We will continue to monitor the Meath population. At this point it appears to be a conservation success to savour. Small Blue habitat in County Meath.©J.Harding.